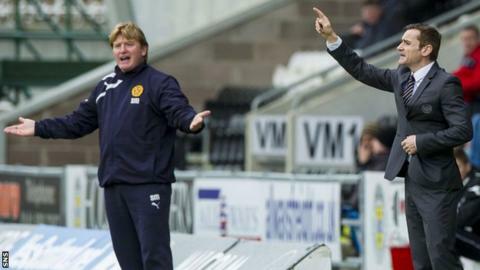 Motherwell manager Stuart McCall insisted stand-in referee Iain Brines "cost" his side victory after their 3-2 defeat at St Mirren. 'Well were leading 2-1 with five minutes left, when Brines gave a handball against Stephen McManus. Kenny McLean scored the resulting penalty before Steven Thompson hit the winner, but McCall felt Brines was wrong to award the spot-kick. "That decision alone has cost us three points," McCall said. "A long ball came at the back post and the ball hits Stephen in the eye socket and the bridge of the nose, and flies out to the edge of the box, and the crowd shout. "The linesman, who is looking right at it 12-15 yards away, nothing. The referee, from I think 30 yards away at the other side of the box, gives a penalty. "Stephen doesn't rant and rave about things. He is an honest guy," added McCall. "Obviously his arms are up when he has jumped but it has hit him flush in the face. "As the game was petering out, we were not only quite comfortable defensively, but I felt we were going to hit them on the break. We had seen the danger out." The visitors looked on course for victory and second spot in the table after goals from Henri Anier and John Sutton. Thompson reduced the deficit before the break and St Mirren gave their survival hopes a boost thanks to the two late goals. Brines was initially the fourth official but refereed the second half after Euan Norris came off with a knee injury. McCall added: "He gave the decision, he felt it was handball. They are honest guys, they give what they see or what they think they see. But I think when you give a decision like that, you have got to be 100 per cent sure. "That's all managers tend to do after games, moan about decisions," added McCall. "Maybe I'm too nice and don't ring [SFA head of referees] John Fleming and send him letters, but some of the things that have gone against us this season have been quite alarming. And that puts the icing on the cake. "I can't be angry at the players because it's not their performances that have cost us three points."